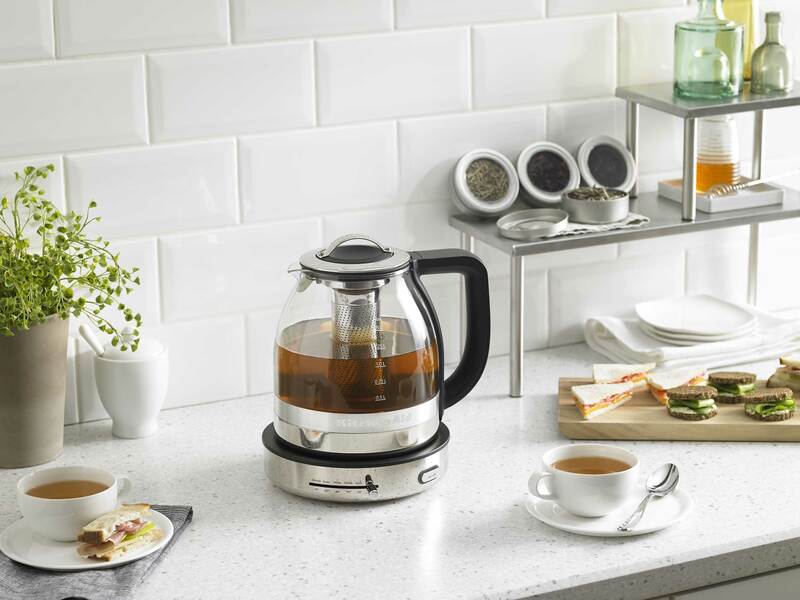 KitchenAid is introducing a new glass and stainless steel tea kettle with preset settings to simply and quickly master a perfect cup of tea. Scheduled for availability this summer, the sleek and streamlined electric kettle is designed to give tea lovers the same level of precision and control that KitchenAid craft coffee products offer coffee enthusiasts. 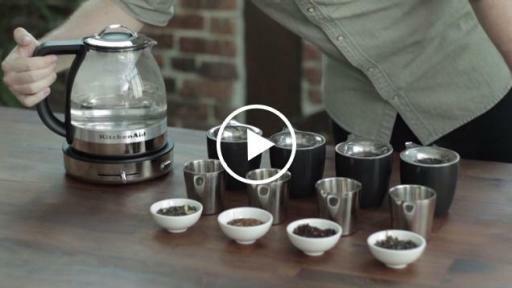 Coupled with its five preset specialty tea temperature settings, the new kettle’s Schott® glass and stainless steel construction create the ideal vessel for tea brewing. Each temperature setting is designed to preserve the unique flavors and aromas of individual tea varieties such as Oolong, herbal, black, white or green. “Having the water at the right temperature and allowing specific teas to bloom and steep to their full potential results in a perfect cup of tea, every time” said Ernst. Built for speed, the Glass Tea Kettle quietly boils water in minutes, then switches to Keep Warm mode for up to 30 minutes before automatically shutting off. The Keep Warm mode keeps liquids at precisely 158° F, and can also be used for brewing more delicate teas. 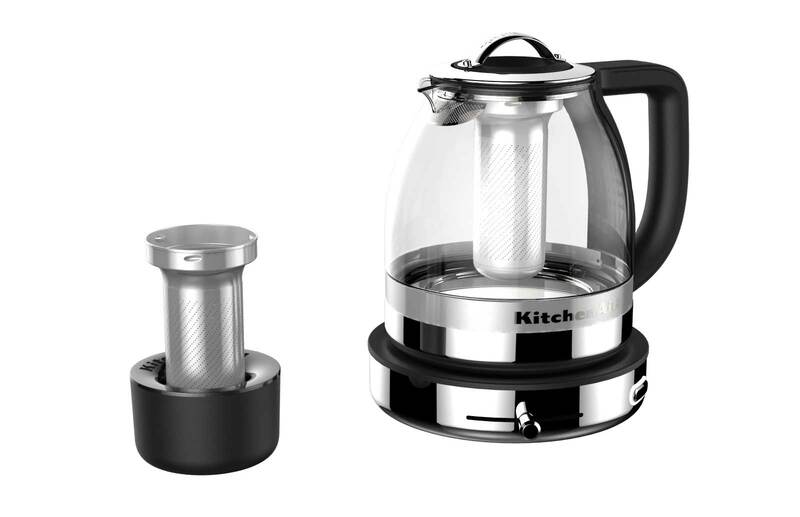 A removable base allows for 360-degree rotation for easy transfer of the kettle and includes an on/off button with white LED ‘on’ indicator light. 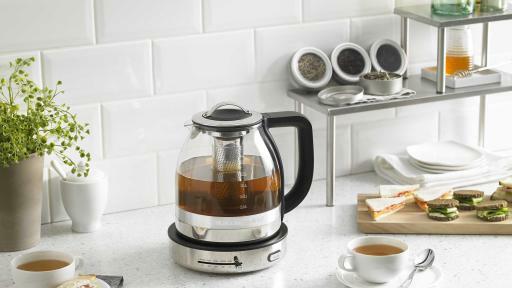 Gina Zupsich and Aaron Shinn, co-founders of the pioneer tea brand August Uncommon Tea, are among those who have tested the new glass tea kettle. "Every tea has an ideal infusion temperature, which is why water temperature control is a crucial factor in brewing the best-tasting tea,” explains Zupsich. “With its variable temperature control, the KitchenAid® Glass Tea Kettle allows you to brew every kind of tea perfectly,” adds Shinn. 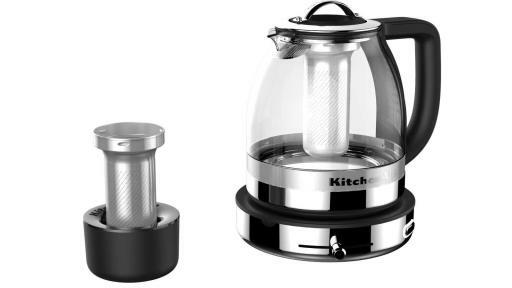 Additional features that tea lovers will appreciate include the easy to fill 1.3L kettle with convenient water level markings and a stainless steel steeper that can be easily removed at the proper time to prevent tea from over steeping or to boil water for other uses. A portable steeper holder keeps counters clean from water and tea drips during and between uses, while a stainless steel lime scale filter clarifies water by filtering out impurities that can alter the taste of teas. The KitchenAid® Glass Tea Kettle will be available this July at a suggested retail price of $169.99.